A U.S. judge has dismissed piracy charges against six Somali men accused of attacking a U.S. Navy ship off the Horn of Africa in April, although the group still faces several lesser counts. Attorneys for the men had argued the defendants' actions did not amount to piracy because they did not board or take control of the USS Ashland in the Gulf of Aden or take anything of value from it. U.S. District Judge Raymond Jackson in the eastern city of Norfolk, Virginia agreed Tuesday, ruling that the government failed to establish that any of the "unauthorized acts of aggression" committed constituted piracy under the law. Prosecutors accused the six of opening fire on the USS Ashland from a small skiff. 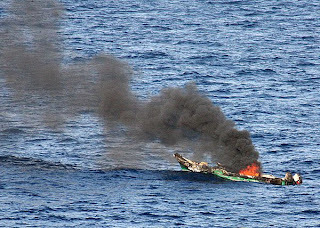 The U.S. vessel returned fire, sinking the skiff and killing one occupant. All others on board were captured. The U.S. Justice Department has declined to comment on the case. Not really a stunning victory for the Somalis, there are still those "lesser charges" to face - though the threat of life imprisonment may be gone. Shooting at people at sea is still some sort of crime even if those shots didn't result in capture of a targeted ship. There is scarcely a writer on the law of nations, who does not allude to piracy as a crime of a settled and determinate nature, and whatever may be the diversity of definitions in other respects, all writers concur in holding that robbery or forcible depredations upon the sea, animo furandi, is piracy. The same doctrine is held by all the great writers on maritime law in terms that admit of no reasonable doubt. We have therefore no hesitation in declaring that piracy, by the law of nations, is robbery upon the sea, and that it is sufficiently and constitutionally defined by the fifth section of the act of 1819. Robbery normally involves the theft or taking of something under the threat of force. In this case, as set out here, the would be pirates never got to the robbery part because their skiff was blown up before they had a chance to fulfill the crime. This is a different situation than that of the Somali who was captured on the Maersk Alabama. In the cases involving ignorant men shooting at warships apparently in the mistaken belief they were some other sort of prey and then getting their boats blown away by counter fire, you have . . . assault and very poor target selection. So, in the absence of a Congressional act that defines piracy to includes something more than "robbery upon the sea" the result, based on this case, which, admittedly, has been buried under dust for some time, not a surprise. If Congress wants to protect warships in situations like this, they can write the law to do so. I suspect that in the golden days of yore, not many men who took an armed vessel under fire ever lived to be able to plead the defense offered up in this case . . .
UPDATE (19 Aug 2010): Having read the opinion (which you can download here) and reviewed the comments made here and here, let me note that there is controversy among lawyers far better read in international law than I about the applicability of the definition of piracy found in the 1958 Treaty on the Law of Sea (ratified by the U.S.) and/or the United Nations Convention on the Law of the Sea (not ratified by the U.S.). (3) Any act of inciting or of intentionally facilitating an act described in subparagraph 1 or subparagraph 2 of this article. 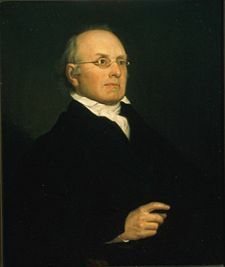 However, the Court finds that despite the fact that the crime of piracy is generally recognized in the international community, Smith is the only clear, undisputed precedent that interprets the statute at issue. The international sources the Government provides are unsettled. 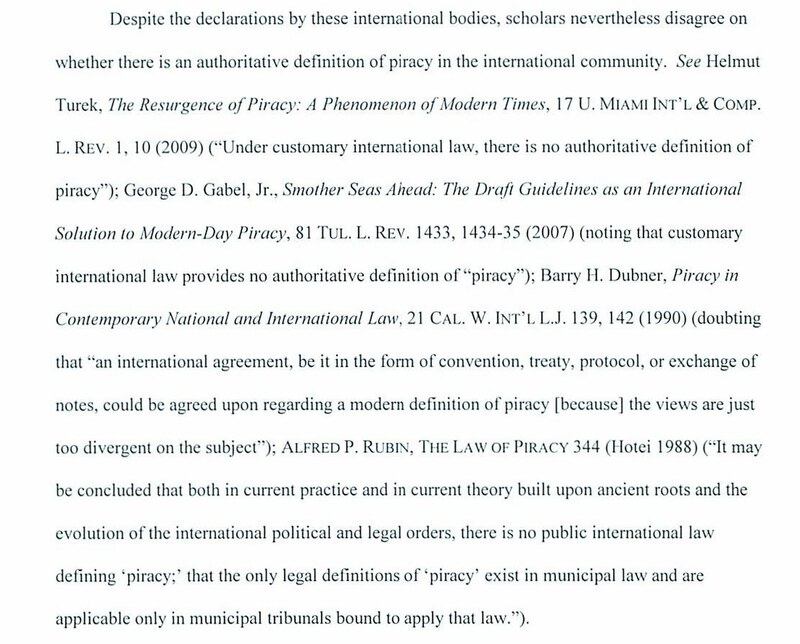 ...The Law of the Sea treaty clearly includes attempts as part of piracy. 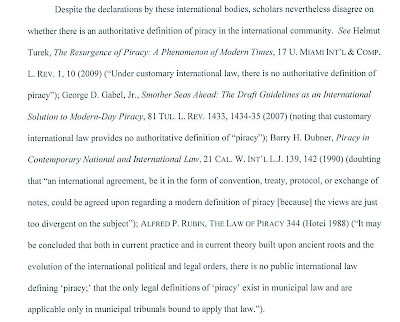 Here the judge errs in claiming the U.S. did not ratify the treaty: it ratified the 1958 version of the treaty that had the same piracy language. And Washington accepts the current UNCLOS as stating customary international law. Moreover, the Executive has in recent times treated attempt as part of piracy. In 2006 the US Navy captured some Somalis in the Gulf of Aden and turned them over for trial in Kenya on piracy charges (the first such handover). 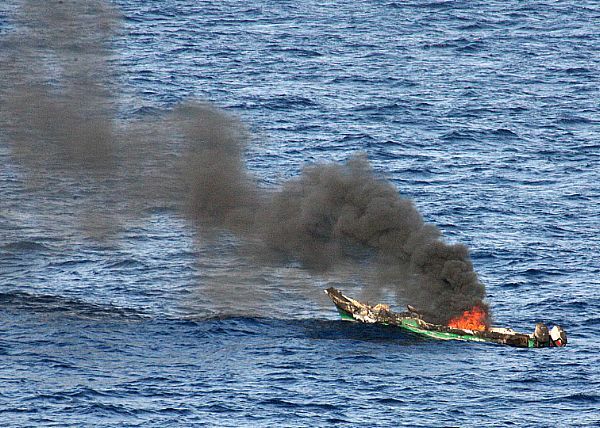 The incident involved an attempted piracy. The opinion’s due process argument is also pretty weak. 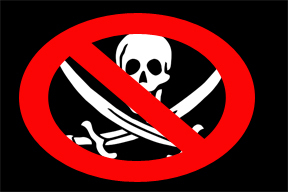 If one is on notice that piracy is illegal under international law, isn’t one also on notice that trying to commit it will also get you in trouble, especially when as in this case the attempt failed not through lack of trying, but solely because of resistance by the would-be-victim? All of which points out a reason why there are appellate courts. IANAL, but doesn't the attempt to commit a crime get treated the same as the crime itself? Should they have been charged with attempted piracy? Ken, they were also charged with attacking to plunder a vessel, acts of violence against people on a vessel, and assault with a dangerous weapon. That first one is "attempted piracy". All those charges still stand. "Attempted X" is usually punished somewhat less than "X", and in this case the net effect is to eliminate the death penalty. They still face a long long time in jail.